Always guide the roller sunblind by hand. Do not let it snap back suddenly as this would damage the automatic roller mechanism. Do not drive the vehicle with the roller sunblind hooked in and the side windows opened simultaneously. 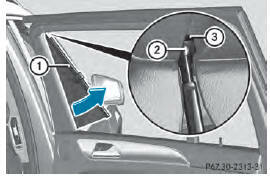 The roller sunblind can jump out of the retainers and spring back suddenly when driving at high speeds, e.g. when driving on the freeway. This could damage the inertia reel. 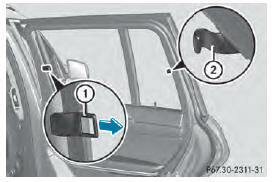 Therefore, either close the side window or retract the roller sunblind before driving at high speeds. To extend: pull the roller sunblind out by tab 1 and hook it onto retainers 2 at the back of the window. The roller sunblind can be hooked back into place should it pop out from the top of the guide rail. ■ Tilt pull-out profile 1 as illustrated. ■ Slip guide bush 2 into open area of guide rail 3. ■ Straighten up pull-out profile 1 again.